Hosting stylish shoe theme party and looking for faux Louboutin decorations? 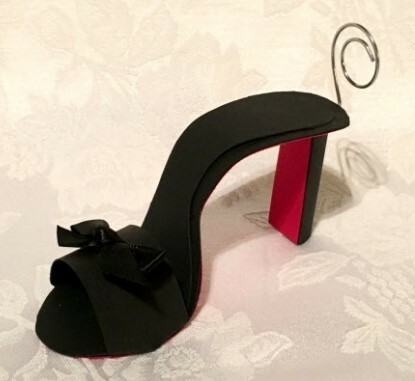 Our black stiletto with red sole place card holders will lead your guests to their seats in high fashion! Your choice of red ribbon or black ribbon. 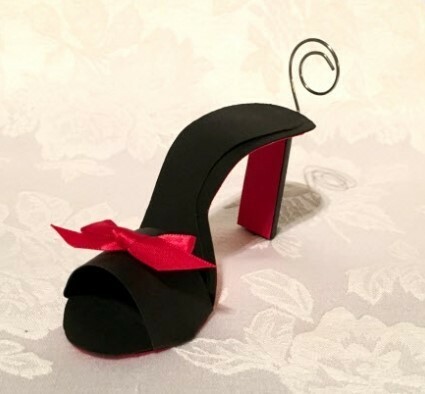 Our gorgeous stiletto card holders measure approximately 4" long x 2" tall at heel (without clip 2. 3/4" with clip) x 1 3/4" wide at the toe. Made from sturdy card stock.